Fusing fashion and function, clothing maker Jerry Leigh Apparel is aiming to save you from headphone cable tangles with HoodieBuddie and InSound––an assortment of hoodies (hooded sweatshirts) and jackets with earphones cleverly built into the hood’s drawstrings. The cable connecting the earphones to your MP3 player is neatly contained inside the garment and emerges into a pocket-within-a-pocket, made to hold your device and keep it separate from whatever else you want to carry, such as house keys. All of the garments are machine washable because the earphones’ components are sealed against water intrusion, but a spokeswoman for the company does advise against machine drying. Repeated heating may damage the electronics, she says. Inserting hood drawstrings in your ears can look quite bizarre to uninitiated observers––mostly because they create rather large loops. I also wish the integrated earphones’ cable were a bit longer, so my MP3 player's controls would be easier to access while inside the HoodieBuddie's pocket. But there’s no denying the convenience of tangle-free earphones that you won’t ever lose or misplace. I recently sampled a HoodieBuddie and liked the cable management, but I was slightly disappointed by the audio quality of the earphones. I found the bass reproduction to be a bit weak. 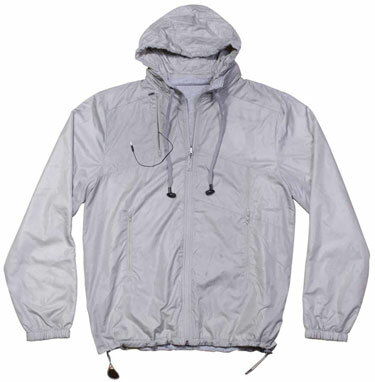 The HoodieBuddie and InSound collections have been recently updated with new spring styles. 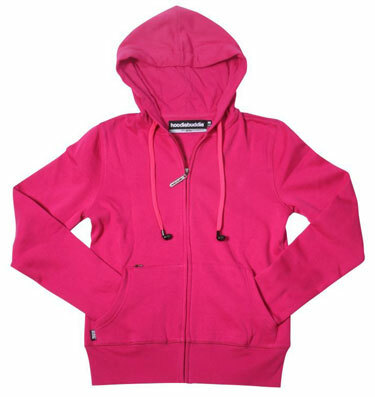 HoodieBuddie garments range in price from $40 to $48 for women and from $44 to $48 for men. InSound garments cost from $49 to $77 for women and from $58 to $132 for men. My daughter just bought one just like the pink one except with graphics, and it only cost her $3.00. Brand new, close-out at a major-mart.